This page contains a bunch of different products, mostly derived from various types of rock. Other than perhaps the first two, rock dust and calcium carbonate, you won’t generally use them unless you have a deficiency of specific minerals. If you just need 20-40 pounds of something, it will probably be worth it to get it from me to save yourself time trying to find it locally. Glacial rock dust and basalt rock dust are broad spectrum, organic mineral fertilizers that everyone can use without a soil test. In the last century, our actions have caused a depletion of soil minerals to the point where many of our soils are severely deficient in minerals. One of the ways this problem gets fixed is when volcanoes erupt, distributing minerals around the earth, and during periods of glaciation, when glaciers break up and redistribute many different kinds of rock as they move across the land, resulting in big changes in soil fertility. Fortunately, we’ve learned that we can do a little work ourselves by taking basalt rock dust (from volcanoes) or glacial rock dust (ground up and brought together during the last period of glaciation), and we can add them to our soil to boost fertility. The reason we prefer either glacial rock dust or basalt rock dust is because they’re a mix of many different kinds of rocks, so they offer a wide array of minerals. That’s the goal of remineralizing the soil with rock dust minerals, to get a broad spectrum of minerals back in there. Now, I know it seems kind of crazy to bring some ground up rocks into the garden and expect the benefits will be worth the money, but using rock dust for gardens and farms has been researched for over 70 years with amazing results, often producing bigger, tastier and more nutritious foods. In my opinion, using either glacial rock dust or basalt rock dust can be one of the most important things to do on depleted soil. I used to always go for glacial rock dust, but then I found a basalt that had a significantly higher mineral count pretty much across the board – for the same price as glacial. So that’s what I use now, and that’s what I sell here. But if you’re looking for bags of rock dust from your local fertilizer supplier, both glacial and basalt are great. Remineralize the Earth is doing a lot of research on rock dust for gardening. They recommend between 150 and 500 pounds per 1000 square feet. Still, good results have been seen with less than 5 pounds per 1000 square feet on some occasions. If you’re getting dust from a quarry for a good price, I say go for it. But if you’re buying it in bags, I recommend 50 pounds per 1000 square feet as being a good number. Even then, it seems that applying less can still bring some great benefits, so just do what you can, even if that’s only 20 pounds per 1000 square feet. Used to remineralize soil with dozens of trace minerals that are needed for optimal plant health. The best forms of dust because it contains many different rocks, meaning a more diverse nutrient profile. Worth it to buy from me for a small garden, but too expensive for a big garden. Calcium is one of the most important minerals for both plants and microbes, arguably the most important. Without enough calcium in the soil plants can’t access or utilize nutrients very well. Likewise, foliar fertilizers and microbial inoculants won’t have as big of an effect if there’s a major calcium deficiency. Obviously, calcium fertilizer should be applied when a soil test indicates a calcium deficiency. But this is the main mineral fertilizer other than rock dust that I recommend anyone can apply without a soil test if they use only 10 pounds per 1000 square feet. It’s just so important to have the calcium out there and most of us will benefit. You don’t want to go applying more than that, though, unless a soil test says you need it, because it is possible to use too much. It’s not to be confused with hydrated lime or quick lime, which can burn crops as well as your skin. Calcitic lime contains approximately 30%-40% calcium and often around 2-4% magnesium. If a soil test says I need calcium carbonate, I’ll use 10-45 pounds per 1000 square feet in my garden, often spreading that out into 2-4 applications throughout the year, once or twice each in the spring and fall. Gypsum is calcium sulfate, so it brings in both calcium and sulfur, both of which our soils are often deficient. Phosphorus is the other most important mineral after calcium. It’s generally present in the soil, but often unavailable in soils with a low organic matter content and a lacking soil food web. While in the past I’ve recommended soft rock phosphate as my favorite source of phosphorus, it can be hard to find. 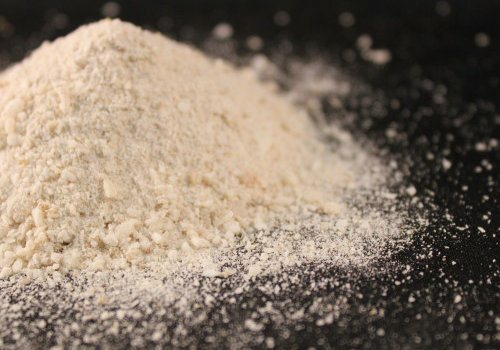 And more recently I discovered fish bone meal, which has nicely “available” phosphorus, plus a little bit of nitrogen to boot, so that’s what I go with now. It contains about 20% phosphate and 24% calcium. Same goes for magnesium – it’s an important mineral, but most of us have enough of it already. That said, someone of us do need it. For example, my soil is a rare one that has plenty of calcium, but needs a little magnesium and potassium. The first fertilizer below supplies both, so if you’re short on both potassium and magnesium, it’s a great choice. If you do need potassium and magnesium, this is your best choice. K Mag is well known in the eco farming world as a quality organic potassium fertilizer. It’s approximately 27% sulfur, 22% potassium and 11% magnesium. It’s also known as Langbeinite or Sul-Po-Mag, and is one of the most useful mineral fertilizers – some soil consultants consider it to have a very positive energy for the soil. It’s my favorite source of magnesium, much better than dolomite lime, and my favorite source of potassium, too. Most of us will benefit from the sulfur as well. Contains about 10% magnesium and 13% sulfur. This is great if you need those 2 minerals, and a much better source of magnesium than dolomite. Also known as sulfate of potash, it contains 50% potash and 18% sulfate. This is great if you need those 2 minerals, and a much healthier source of potash than potassium chloride. Greensand is a sandstone with approximately 7% potash and a fair amount of iron and silica, as well as a very broad spectrum of trace elements. Although the potassium is tightly held and slowly released, I do like greensand because of the benefit of the silica and trace minerals that come with it. I don’t recommend it all that often, but if you need potassium without the magnesium, this is exactly what you need. You can get most of your nitrogen by composting and making good use of your grass clippings, but occasionally it’s worthwhile to have some more. Feather meal is perhaps the best source of nitrogen. It’s organic, yet contains around 12% nitrogen. These are some extra specialty fertilizers that are used in small amounts, generally when a soil test says you’re deficient in specific minerals. They’re generally used by people who know a bit about how to use them. *The prices change depending on how many pounds you add to your cart. Elemental sulfur (about 90% sulfur) is used when your soil is deficient in sulfur. If your soil is also deficient in calcium, you might use gypsum instead. Solubor (about 20% boron) is used when your soil is deficient in boron. Copper sulfate (about 25% copper) is used when your soil is deficient in copper. Manganese sulfate (about 35% manganese) is used when your soil is deficient in manganese. Iron sulfate (about 30% iron) is used when your soil is deficient in iron. Zinc sulfate (about 35% zinc) is used when your soil is deficient in zinc. Humic acids come as a black powder. They’re used in foliar sprays along with organic fertilizers to help the plant better uptake and utilize the nutrients in those fertilizers much more effectively. The quality of humic acid products varies widely. This one is very good, containing over 90% soluble and contains a minimum of 85% humic acids. Before application, first dissolve the powder in warm water at 5 Tbsp (1/3 cup) per quart of water. That quart will cover 2000 square feet, but doesn’t have to be used right away – you can store it. When you’re ready to use it, mix that liquid with at least 50 times as much water, which is again 5 Tbsp (1/3 cup) per gallon of water, or 3 gallons of water for each 1 cup of the liquid. Hi Phil, I’m wondering if what I found is a good source of rock dust or not. It seems to me to be sand but they say it comes from river bottom. The only thing I can find near me is more like pea gravel and I don’t need any more rocks in my soil! I put some in garden soil and transplanted my tomatoes into this mix and they are thriving. So is it safe to use this as rock dust in 150-500#/1000 sq ft? Ya, it can be hard to tell. Here’s a test from the Remineralize the Earth website: “Fill a clear glass half full with your sample and cover it with about two inches of water. Shake it up vigorously, then allow it to settle overnight. The dust, silt and sand will settle into three distinct layers with the dust at the top [and the sand at the bottom]… this will tell you if you are buying mostly sand.”That can be helpful, but can also be difficult to analyze if you’re not used to doing this kind of sedimentation test. Another method is to grow some plants with the dust and some plants without and see if there’s a difference. The ultimate method is to get a chemical analysis from a soil lab.In the end, I can’t really say for sure how safe it will be to use your dust. It’s not like it’s toxic, but if it’s sand, it can cause a few issues if you use a lot. Hi Phil,I live in Calgary and I got my soil tests back from CSI in the states. Its calling for specialty fertilizers like zinc sulfate, copper sulfate, boron and sulphur. UFA doesn’t sell that stuff and neither does gardeners pantry or you (to Canada). Do you know where your countrymen can get this stuff? Phil I am interested in your products but live in Canada. Do you know how we can obtain them? Are you still in Canada. Thanks for your help. Just got Ca carbonate, humates and fish bone meal. First time application. Am gardening on raised beds under landscape fabric for my tomatoes, peepers and eggplants. I have not done soil testing yet so want to apply just small amount of that stuff to help with flowering and fruit formation. Do I just work it gently in top soil right around the top of the plants or go deeper but to the side with Ca and Fish meal. Also is it advisable to soil drench humates or foliar app is much more effective… Thank you! My gardens are so beautiful now! Ideally the calcium carbonate and fish bone meal would be spread across the whole area and lightly worked into the top inch or so of soil.For the humates, both soil and foliar applications mixed with organic fertilizers are useful. Foliar is like a 1:600 ratio with water and soil can be more like 1:200. Question regarding general fertilizing- how do you know if you are overfertilizing… I have started fabulously with most healthy plants I ever seen at my community gardens only to see more and more fungal and bacterial problems coming in. It seems we started with such good note, right size, right leaf color, loads of large great tomatoes and now it is most loaded with fungal and bacterial diseases. If I think I might have overfertilized how do I know it… and what to do now… I have been working with Serenade, Actinovate, Copper and eventually Daconil and am barely making a dent. Also I have started using Texas Tomato food weekly to try help tomatoes to grow along… any opinions are welcome… do I continue to support current few large formed tomatoes and general growth or slow down to feedings… also if humic acid is of any help adding in between with some microbial additional like Mycogrow etc for soil drenching… I work on community plot and have limited ability to bring organic mater so in the spring all I have is partially worked compost out of leaves, manure and food peelings. My worm poplation is increasing but is not more than 5 per sq f. Lots also gets tilled by village every spring before I receive it and every fall in Nov after I relinquish it. Overfertilizing can show up a lot of ways, especially discolored/burnt looking leaves or lots of plant growth without fruiting, or as you say, pests can indicate overfertilization too, but pests can indicate other health issues, as well.Weekly feedings of your fertilizer are fine as long as you’re following the label, but if they say to feed monthly, you’d want to cut it back by 75% if you’re feeding weekly. Humic acid can be helpful – certainly doesn’t hurt as long as you don’t use too much.As for what to do when you have pest problems, that’s a more difficult one. If you’re already spraying all of those products, some of which are quite toxic, and it’s still not helping, there’s not much you can do to get rid of pests in the short term. The plants are obviously quite sick for some reason, but that could be a lot of reasons. It’s excellent stuff Michael. Top quality. Go for it! I have one more question, then. With the calcium content it has be enough to also help bring my ratio of calcium to magnesium to a 10:1 level, when my calcium to magnesium level is 2025 lb/A and 62.5% saturation to a 557 lb/A and 28.4% saturation? Or do I need to put a calcium supplement down, as well, to get my magnesium percentage down compared to my Calcium content? By the way, your teaching is top quality. I have really learned a lot in a short time about my garden from you, and I can see that the things you are teaching are actually showing to be the case in what I am experiencing in my garden. Good work, man! I also love the understanding I am getting about my garden from getting the soil sample done. Ya, it looks like some calcium carbonate (calcitic lime) is in order. A rough estimate is 20 pounds per 1000 square feet. Hello, from Alberta. I’ve been gardening the same plot for 10 years now. Started with an almost dead soil, sprayed with 2,3,D and grass-cuttings bagged and disposed to the landfill. Starting with zero topsoil, a pure brown/beige clay I decided right away to go organic.As I’ve dug up large areas of “lawn” I have removed all garbage and stones. Those stones (probably 100s of pounds of them) I have discarded into the alley or given to neighbours for use under new fence posts, etc.This year I started reading about remineralizing soil (got the book “The Intelligent Gardener” by Steve Solomon) and it occurred to me that these stones I’m throwing out could be crushed up and put back in the garden. It seems the lighter coloured stones are basically calcium, potassium, sodium and magnesium. The darker coloured stones are the lesser-elements: iron, copper, etc.I got a small anvil, put it into a cardboard box and smashed up a number of these stones, mostly into very fine particles. I managed to crush up about 5 lbs in about 15 mins and threw it onto my veggie patch.What do you think of this as a cheap solution to get rid of stones and also to help fertilize a garden? Are there any dangers other that potentially knocking my eye out?Thanks for your timeDavid R.
I suppose the danger is that if the stone is a limestone or other type of stone that has just a couple of minerals, it could cause a fertility imbalance. I doubt that’s the case though, and if you’re just doing that small amount, it won’t be an issue anyway. It could start to be an issue with I’ll say 20 pounds per 1000 square feet, but again, only if it’s a specific type of mineral. If it’s more like glacial rock, you’re good to go. Do you know any geologists? Hello Phil,My garden is already in and mulched with leaves. If I apply the elemental sulphur, copper sulphate and iron sulphate by broadcast, will I be wasting the minerals or will they eventually reach the soil and be beneficial? They will eventually reach the soil. It’s actually nice to apply them to the leaves and let them gradually work their way down with rain/irrigation. Hi Phil, Do have a recommended maximum application rate per year for Ferrous Sulfate? My soil tests show my garden is a bit low in iron (I am aiming to have twice as much iron as manganese and I don’t), and I would like to add a bit to feed the crop this year. I understand that as I improve the biology in the soil more iron should become available. Thank you! Good question, Molly. I’ve heard max 10 pounds per 1000 square feet per year, but that seems like a lot to me. Personally, I wouldn’t apply more than 2 pounds per application. Iron is important, but I don’t want too much. As you increase biology, humus, and balance out the macronutrients, iron availability will probably improve anyway. I’m so thankful for your help! Last year did Academy, now I justify your book and adding minerals. In your info on Gypsum, you didn’t mention how to add. Last night I put about 2 Cups in a 5 gal container to fertilize soil. The mixture consisted of: org. Composted chicken manure, fox farm sea potting soil, G&B harvest Supreme, 2 Cups fish meal. I haven’t gotten a soil test, yet. I noticed I have a LOT of grass issues; some I’ve never seen before. I sprayed once with calcium and a lot of crab grass died. I plan on spraying again, as there’s no guarantee the grass died from lack of water, or the spray. Hi Claire, obviously without a soil test we’re just guessing. I feel comfortable with 10 pounds per 1000 square feet. A soil test might very well suggest more. It’s tempting to think “I’ll just throw on 20”, but what if your calcium is already high and it’s really magnesium or potassium you need. Of course, that would be the argument against adding even the 10 pounds, but that amount won’t impact things too much. Hello, hello! Today I received my order of Basalt Rock Dust and Calcium Carbonate. Since applying the recommended ingredients from the Beginner, Intermediate, and Advanced categories, my patio garden has exploded! I’ve only one more large pot to mix the soil and plant. So….how best to apply the Basalt Rock Dust and the Calcium Carbonate to an already established patio garden filled with various sizes of happy edible and flowering plants? Can I simply add the BSR and CC to the already planted pots by pulling back some of the soil, making a trough around the plant(s) and then smooth the dirt back into place? Can you tell me what percentage of elemental copper is in your Copper Sulfate? And what percentage of elemental zinc is in your Zinc Sufate? I am needing specific percentages per my soil analysis. The Copper Sulfate is 25.5% copper and 12.8% sulfur. The Zinc Sulfate is 35.5% zinc and 17.5% sulfur. It’s often a phosphorus deficiency. Monoammonium phosphate (MAP, 11-52-0) is one of the few synthetics I recommend because it’s an excellent source of phosphorus. Soft rock phosphorus and fish bone meal are organic and they’re great in the long term, but often take years to become available. Even an organic liquid fish hydrolysate could help because it has a little phosphorus. We recently moved to North Carolina, and the soil is quite different. It has little top soil above rocky hard clay, with layers of quartz rock, and patches of white sand. Some of the sand is hard, almost like rock. Maybe sandrock? It is nearly impossible to get a shovel more than 2 inches into the ground. There are also patches of pure sand. Two years ago I started by covering soil with 4 inches of wood chips. Many varieties of fungi grew until the wood chips decomposed. Last year I added many bags of gypsum on top, then an inch of compost. The soil on top looks more lifelike, and has become more workable. But it is still rocky and hard below. Digging a hole is a tedious process using a Maddox, and removing rocks. I want a small fescue lawn, flower and vegetable gardens. It was tedious planting a few trees and bushes. I added compost and worm castings, and they are doing well. It gets hot in the summer, so grass will not make it through the summer in this soil as roots cannot penetrate. Any ideas on how to break up rocky hard pan clay and remove rocks, including with hard patches that appears to be sandrock? At the present pace, working with Maddox, it will take months if not years. I wish to use organic methods, and have resisted using heavy machinery or tillers. Any advice is appreciated! Good question. It’s going to be some combination of 1) a lot of organic matter, 2) microbial inoculants like good compost tea, and 3) balancing out the soil nutrients. If you were to email the folks at International Ag Labs or Crop Services International, they would probably focus you more so on 3, whereas if you work with more biologically-oriented folks like SoilFood Web, they’d no doubt lean to 1 and 2. Personally, I go for 1-2-3 all together. Last, we’d all probably tell you not to force a lawn where it doesn’t belong, but I understand it has some nice benefits. Hope that gives you a starting point. We have heard and you confirm that getting calcium and phosphorus into your soil should be your first priority. We had a soil test last fall that tells us we need calcium at 10 lb per 1000 sq. ft. and phosphorus at 150 lbs per 1000 sq. ft. We can get local gypsum for the calcium at a good price. But we can’t get rock phosphate or fish bone meal. You carry the fish bone meal, and you say it contains about 20% phosphate and 24% calcium. Does that mean that if we buy it we won’t the gypsum for calcium? Also, doesn’t 150 lbs per 1000 sq ft seem like a lot?! (To clarify from the report, we have 74 ppm phosphorus and want 353 ppm; add 150 lbs 20%P205.) We would like to purchase what we need as soon as possible and appreciate your advice! Thanks! The calcium in rock phosphate and fish bone meal isn’t in an available form, so it doesn’t count much for calcium. Your gypsum is good, provided you also need the sulfur, which more soils do than don’t. Yes, 150lbs does seem right based on your numbers, but you don’t necessarily have to add it all in one year. I’d be apt to split it into 50lbs a year for the next few years, and I’d tend to apply half of that in the spring and half in the fall each year, although it’s more important that it gets applied at all. Note that some people would just throw all 150lbs on at once, and that’s not inherently wrong – I just prefer smaller changes so nothing gets wasted/leached/eroded, among other reasons. I recently discovered your website and am so excited about learning more about organic gardening. I’ve been gardening for over 30 years and have been in a garden club, but just recently began learning about organic gardening. I’ve been reading your articles on line, listening to your videos and ordered and began reading your book Building Soils Naturally. I’m having a hard time putting the book down, as I’m so excited about all that I’m learning. I’ve been telling a lot of my gardening friends about what I’m learning. I live in northern Illinois, and am interested in ordering your EM and other products, but I was wondering if I can apply it now in November with the cold weather approaching or should I wait until the spring? Also, I tried to sign up for your online class, but by the time I checked my email, it was too late to sign up. Will the same class be offered for free when I place my order? If not, how can I sign up for your class? Hi Debra, you can get on the waiting list again when you’re ready ( https://www.smilinggardener.com/academy/ ), as I open the course up from time to time (the full course isn’t free – I just give out a small section from the course when you get my products). I am in Vietnam, I really want to use products from you, do you have a better way? Sorry, I can only ship within the U.S.